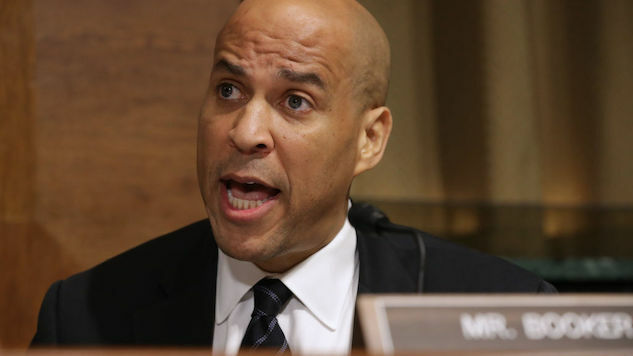 A report from TYT reveals that Cory Booker has received financial support from the manufactures of the tear gas used against migrants at the U.S./Mexico border this past weekend. The defense supplies vendor is called Safariland and owned by Warren Kanders. Some research into Booker and Kanders’ relationship brings about some strange revelations. Warren Kanders and his wife Allison have both donated personally to Booker’s election funds, and even hosted a private campaign fundraiser on his behalf. In 2013, Warren made a donation of $10,400, but exceeded campaign finance limits in doing so. As a result, Warren was refunded $5,200. Later, Allison Kanders proceeded to do the same thing. She donated the same amount, $10,400, then was given half that donation back. Also in 2013, the Kanders worked on a committee that organized a private fundraiser for Booker’s election campaign. In 2014, the family donated another $5,000 to Booker. During the course of the 2016 election, Warren and Allison Kanders made a few donations to Hillary Clinton, too. In one incident, Allison was fully refunded the $2,700 contribution she made. It’s unclear why, though, as, per TYT, the amount didn’t exceed campaign funds, Clinton didn’t decline the offer and there isn’t even a record of whether Kanders requested the money back. This is odd on its own, but it goes back even further. The Kanders apparently had a political change of heart between the late ‘00s and 2013. The couple donated much larger sums of $10,000, $28,500 and $68,000 to groups such as the RNC, Colorado Republican Committee and Republican Campaign Committee of New Mexico. That biggest number went to McCain’s Victory Fund in 2008. Though Safariland did not provide all the product used against the asylum seekers, it’s reported to have provided a portion of the tear gas. Booker did oppose the gassing on Twitter, but hasn’t responded publicly to these odd connections.